We Can(ada) Read: 2017 Canadian YA/MG Debuts! Today I'm telling you about the 2017 YA and MG debuts by Canadian authors! Since it's still early in the game, this list could potentially be incomplete, but these are the ones I know of! If you know of any others, please let me know and I will update this page accordingly. Finley and Oliver's stable friendship. As Emma and Oliver grow closer, Harlan finds his attention shifting from Juliette to the quiet, enigmatic, and thoroughly unimpressed Finley. Out of boredom, Harlan decides to make her fall in love with him. Problem is, the harder he seeks to win her, the harder he falls for her. Emily King's debut THE HUNDREDTH QUEEN, when an orphan discovers the real reason she is claimed against her will by a tyrant rajah, she turns to practitioners of a forbidden magic to help her and her best friend escape before being forced to fight in an age-old tournament to the death to take her place as the rajah's one hundredth queen. Get the gorgeous new boy next door, Zach, to know she even exists. But when Tracy and Ralph discover an envelope stuffed with money in the dugout at the baseball field (and Lester forces them to let him tag along), they have a mystery on their hands. Did someone lose the cash? Or, did someone steal it? St. Stephen has always seemed like a quiet place to live, but soon the town is brimming with suspects. Now they’re on a hunt to discover the truth, before the trio is accused of the crime themselves. 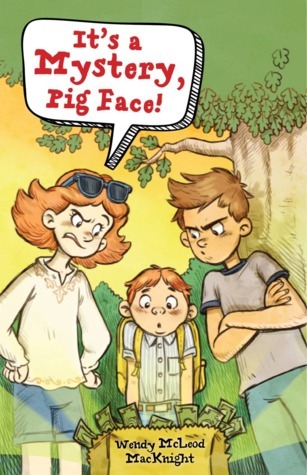 McLeod MacKnight’s debut middle grade novel is a funny, charming window into small-town life, with a focus on the importance of friendship and family and the struggle to figure out where you fit in, perfect for fans of Polly Horvath and Sarah Weeks. These sound great and I especially love the sound of Seeking Mansfield and Maybe in Paris. I'll be keeping my eye out for both.